iDroid is the first Bluetooth controller for Android and iOS that doesn’t require an app! 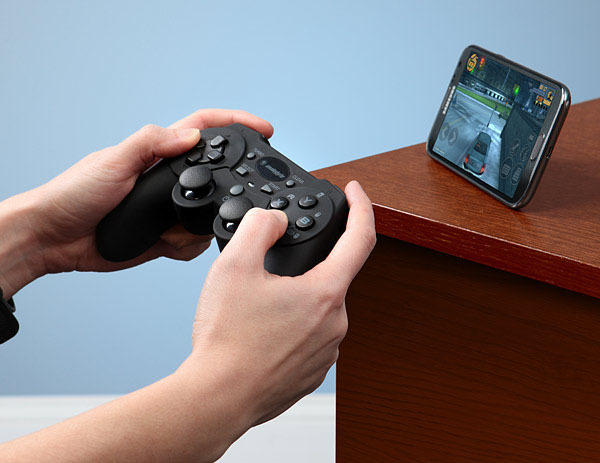 Play your mobile games with a real controller, complete with analog thumbsticks, a digital gamepad, six digital buttons and two analog L and R triggers. iDroid can support controller function, mouse, keyboard, mouse/keyboard, and can even be used for iCade apps. Its ergonomic design will keep your hands comfortable while you game, making it the essential accessory for Android and iOS gamers. The wireless Bluetooth controller also features a Li-Ion rechargeable battery which can be charged directly via the attached USB cord.